No city in America has been as scarred by terrorism, or as enriched by immigrants, as the city of New York. 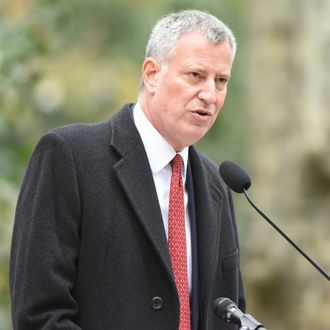 On Tuesday, Mayor Bill de Blasio announced that the city would welcome Syrian refugees, in defiance of the former legacy and in defense of the latter. The mayor’s statement came in a moment of widespread opposition to President Obama’s plan for resettling 10,000 Syrian refugees in the United States. In the wake of last week’s terrorist attacks in Paris, 30 governors have written letters to the president demanding that no Syrian refugees be placed in their states, at least in the near future. De Blasio released a statement directly addressing one of those state executives, New Jersey governor and nominal Republican presidential candidate Chris Christie, who had voiced opposition to welcoming even those Syrian refugees who were under 5 years old and orphaned, earlier in the day. New York’s Democratic governor Andrew Cuomo struck similar notes to his downstate rival in remarks before Harvard’s Kennedy School of Government on Tuesday night, the New York Daily News reports. Cuomo went on to mock the political pretensions of those governors who have declared their opposition to resettling the refugees even as they lack the federal authority to do so. After all, state borders are internally open, and any refugee resettled in one state will be able to travel to any other. “What, are you going to have your militia fight the federal government at the borders of your state? It’s a pure political statement,” he said. Many of the governors who currently oppose refugee resettlement have couched their objections in concerns with the screening process. There is suspicion among authorities in the European Union that one of the Paris attackers may have entered the country with the passport of a Syrian refugee. In an effort to quell fears that the United States inadequately vets its refugees, the White House held a conference call with 34 U.S. governors on Tuesday. Currently, the screening process involves an interview, biometrics, fingerprinting, and biographical investigations to verify the individuals’ qualifications for refugee status as well as any security risks they may pose, according to ABC News. Still, many governors on the conference call found the level of detail provided by representatives of the Departments of Homeland Security and the National Counterterrorism Center to be inadequate. “Arizona is entitled to a formal consultation under federal law, and this conference call did not meet that requirement,” a spokesman for Arizona governor Doug Ducey told ABC News. In an interview with Sean Hannity on Fox News last night, Trump said that the United States had “no choice” but to shut down certain mosques. According to polls, a lot of people really do understand Trump’s point-of-view. A Reuters/Ipsos poll released Tuesday found that more Americans trust Trump to handle the threat of terrorism than any other presidential candidate besides Hillary Clinton, with whom the Donald is tied.